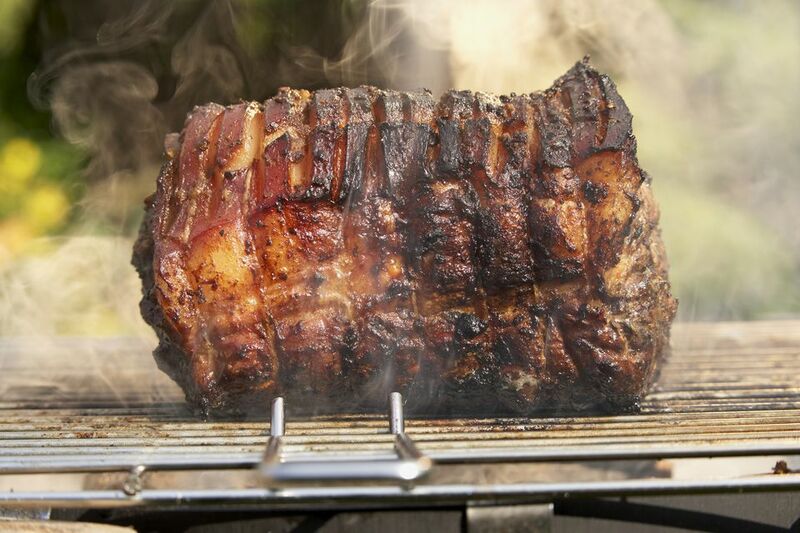 A smoker is an outdoor cooking appliance that can maintain low cooking temperatures for extended periods of time while producing smoke and holding it around the meat for absorption. A good smoker does all this efficiently and provides the space necessary to produce the amount of ​barbecue needed. There are many ways to smoke low and slow and there are many kinds of smokers and smoker/grills on the market. You can buy wood smokers, charcoal smokers, gas smokers, electric smokers, and pellet smokers. Each has its advantages and disadvantages, but the most important factor is you, what kind of barbecue you want to smoke, and how much effort (and money) you want to put into it. Vertical water smokers, like the Brinkmann Gourmet Charcoal Smoker pictured, are the most popular smokers on the market. This is largely due to the fact that they are the least expensive. In the top range of the vertical water smokers is the Weber Smokey Mountain Cooker (referred to online as the WSM). A vertical water smoker is broken into three compartments, the bottom one holding the heat source. In smokers like the Brinkmann and Weber, that heat source is charcoal; other smokers have gas burners or an electric heating element. Above the heat source is a water pan—it is this water pan that makes the system work. The water pan stores and regulates the heat of the smoker, while deflecting the direct heat from the source and providing a moist cooking environment that keeps the meats from drying out. Above the water pan is the smoking chamber. To operate this, all you need to do is build a fire, fill the water pan, and throw on the meat. Vertical water smokers are small so they don't take up a lot of space. Because of their diminutive size, they tend to be more efficient than larger smokers, so they won't need as much fuel or power to run them. They are also among the least expensive smokers on the market. All of this makes a vertical water smoker the perfect starter smoker for the person who wants to give it a try but doesn't want to make a big investment. There are a few negatives to a vertical water smoker, such as limited temperature control and its small size. The Brinkmann, for example, has no adjustable vents; it is designed to work in the ideal smoking temperature range, but it can be difficult to control until you really get the hang of it. The small size of the unit can also be limiting—most of these smokers come with two racks, one in the middle of the barrel and one on top, but to access the lower rack you have to remove the top one. If that rack has food on it, this can be tricky. And because they are generally small, vertical water smokers cannot smoke a lot of food at once. A couple racks of ribs, maybe two briskets, or a pair of pork roasts. While this will certainly serve most families, it doesn't provide for a lot of barbecue considering that you may be cooking all day and plan on leftovers. One of the biggest disadvantages of the vertical smoker is that every time you lift the lid you lose almost all of the heat in the smoker. While the water pan can store heat, it does take time for the temperature to recover. The Weber Smokey Mountain really is the exception to these disadvantages. Even the smaller version is larger than most, and the 22.5-inch smoker is downright huge, larger than most people will need. The Weber also has three control vents in the base and one in the lid. This gives excellent temperature control and is the reason why the Weber is the only vertical water smoker used heavily on the barbecue competition circuit. An offset smoker (commonly called an offset) is a two-part smoker. The main cooking chamber is typically a long grated, metal barrel or box with a lift door and a smokestack. Attached to one end of the cooking chamber is the firebox which has a top or side access door and an adjustable vent. Heat and smoke created in the firebox enters the cooking chamber through a small hole between the two spaces. Smoke then travels out through the smokestack, typically on the other end of the cooking chamber. Unfortunately, for the consumer, the best way to tell a good offset smoker from a bad one is to fire it up, which means you've probably already made the purchase at that point. A bad offset leaks smoke through the doors and the connection between the firebox and the smoking chamber. The only place smoke should be seen coming out from an offset smoker is from the smokestack. The second problem with offset smokers is uneven heating. Temperatures near the firebox in poorly designed offsets can be 100 F (38 C) more than the temperature on the other end. Some inexpensive offsets are also constructed of thin metal, which does not retain heat well. The simple truth is that there are a number of inexpensive offset smokers on the market that are not engineered well enough to be classified in the good category and need to be modified to work effectively. This has led some people to dismiss the offset smoker entirely, which would be a shame since some of the best smokers on the market are offset smokers. A better offset smoker model has doors and seams that seal tightly. This not only keeps the smoke where you need it but also improves the airflow of the smoker making it more efficient. A better offset also uses reverse flow to solve the problem of uneven heating and eliminate that nasty radiant (infrared) heat from the firebox. This modifies the basic design by placing a sheet of metal in the bottom of the cooking chamber. Now heat and smoke travel from the firebox under this sheet to the opposite side of the cooking chamber before rising to the food and traveling back toward the firebox where the smokestack should be placed. Reverse flow heats the cooking chamber indirectly and allows a cooler smoke to flavor the meat. Look for an offset smoker with the smokestack near the firebox. Because inexpensive offset smokers can be so difficult to operate, you probably shouldn't be buying an offset smoker if you are not willing to make the investment. Instead, stick with the vertical water smoker. If you do have the money, there are some really great offset smokers, which still dominate the competitive barbecue world. Smokers by Lang and Jambo are well built, produce great and large amounts of barbecue, and are just plain nice to look at. When people think of offset smokers, they typically think of a round, barrel design. It can be argued, however, that the Good-One Smoker, like the Good-One Open Range, are offset smokers even though they are shaped more like a tool box. You have a separate cooking chamber and firebox and the same airflow, but the Good-One has a square firebox that runs parallel to the cooking chamber. Good-One Smokers also have the key ingredient that makes a great offset: thick metal. Thin metal smokers cannot hold heat. There are few things in this world simpler than a box. Box smokers (also known as vault smokers, cabinet smokers, block smokers) are basically a box with a heat source in the bottom and cooking chamber on the top. Because the heat source is directly below, like in a vertical water smoker, the heat is conserved. The one issue that separates good box smokers from bad ones (like the Camp Chef Smoke Vault, on the low end of the scale) is the insulation. While all box smokers have a lot of similarities, if you set a Pitmaker Vault next to a Stumps Vertical next to an FEC-100, you have smokers that look alike but operate very differently. There are a number of box smokers sold in big box stores that are simply worse than less expensive vertical water smokers. This is because they have no insulation, thin metal, and a poorly fitting door. Typically gas or electric, this type of box smoker is nothing more than a burner or heating element inside a metal box that you can put meat in, with wood chips held over the heat to smolder. A little breeze or a light rain and these smokers lose heat. You would do better with the more efficient shape of a round smoker. The better box smokers cost a lot more, but they do produce large amounts of great barbecue in a highly controllable environment. If you need to smoke barbecue for a competition, catering, or a restaurant, these smokers can be the most dependable and easiest-to-use smokers on the market. Inventor-designer Ed "Fast Eddy" Maurin might not appreciate us referring to his competition staple as a box smoker, but look at its picture. The FEC-100 is a stainless steel, "refrigerator-style" pellet smoker with an airtight door, heavy insulation, and a computer operated temperature control system. With the external pellet hopper and the meat probes, you can load this smoker up and not actually open the door until the temperature control system tells you that the meat is done. The Stumps Vertical Smoker is, like the other good box smokers, highly insulated. The standout feature on this smoker is the gravity feed charcoal system. Charcoal loaded into the back feeds down into the combustion chamber allowing for long smoking times. It is the level of oxygen inside the smoker that regulates the charcoal consumption. Simple and brilliant. Stumps smokers, like the FEC, are popular with barbecue champions. If you are serious about barbecue and want to produce a lot of it, then one of the larger, better made, and more expensive box smokers might be for you. The less expensive versions simply don't have the engineering to be serious about barbecue. The drum smoker (commonly called an Ugly Drum Smoker or UDS) has become popular because it is the simplest smoker to use and, if you purchase a kit, is an inexpensive do-it-yourself project. Typically you can put together one of these with a little skill and end up with a 22.5-inch smoker comparable in size to a Weber Smokey Mountain Cooker. Whether bought fully assembled or not, drum smokers are easy to use, inexpensive, and lightweight, making them portable. The drum smoker is a very basic smoker made of a steel drum with a firebox in the bottom and a cooking rack on the top. The base and lid have vents for adjusting temperature, and the whole thing seals together to prevent smoke leaks. Since there isn't a water pan, this is direct smoking and the radiant energy from the burning charcoal will cook the food. This makes the drum smoker excellent for chicken, pretty good for ribs, but brisket and pork roasts can be more challenging. The secret is to wrap larger cuts in foil when the internal temperature of the meat hits 165 F (74 C), otherwise, it will dry out. While this is always a good general rule, other smokers don't have that direct heat issue. To use a drum smoker, load the firebox with charcoal and light. When the charcoal is ready (not actively burning and white and ashy around the edges of the coals), put the food on the top rack. Put on the lid and lock it in place, then adjust the vents to your desired cooking temperature. Holding the unit at a low temperature will keep the oxygen flow low enough to keep drippings from causing flare-ups. Smoker ovens look much more like an indoor appliance than any other smoker, but they must be used outdoors (because of the smoke production). These smokers look and work a lot like your oven—better in fact. Most of these smokers, like the Cookshack Amerique pictured, have computer controls and temperature probes, allowing you to smoke a brisket while you go to work. Smoker ovens like these are very similar to the ones used by many restaurants. Smoker ovens are a heavily insulated box with an electric heating element in the bottom. The heating element causes wood chips in the pan above to smolder. Between the element and the food is a funneled piece of metal that eliminates direct radiant heat and collects drippings to prevent fires and keep the heating element clean. Meats are placed on the racks above and if the smoker oven has a meat probe, the oven's computer controls and cooks to the desired temperature, and then drops to a holding temperature mode to keep it perfect until you are ready to eat. Smoker ovens are the perfect combination of technology and barbecue and are the ideal solution for the person who loves barbecue but doesn't want to put a lot of work into it. There are a number of manufacturers of these types of smokers, but the leader in the field, both for residential and commercial use, is Cookshack. The SmokinTex smoker ovens are very similar to Cookshack but lower in quality and price. Electric smoker ovens are not inexpensive, or at least they shouldn't be too inexpensive. While you can get a smoker oven for as low as $500, it is the higher priced, more feature-ladened versions that have the function that makes a great smoker oven. Lower-priced models are not just small but have limited controls. If you are looking to buy a smoker oven, you want one that can be loaded up in the morning before work and have fully cooked barbecue ready that evening, such as the Cookshack Amerique. A smoker oven costs you the same to operate—and takes the same amount of effort—whether you are smoking a single rack of ribs or 50 pounds or brisket. So this type of smoker is perfect for the person who might occasionally need a larger capacity smoker but wants to frequently barbecue a single rack of ribs. These smoker ovens must be used outdoors because they produce smoke and carbon monoxide and are rated for outdoor use only unless specially vented. However, they are electric appliances and should not be left to the elements year round. It is recommended that they are used in a sheltered but open space and stored in a garage or other protected area to extend the lifespan. Smoker ovens are an investment and should be treated like an appliance. When U.S. servicemen arrived in Japan as part of the occupational force after the Second World War, they had to adapt to a new way of life. One of these adaptations was to convert a centuries-old rice cooker into what we know as the Kamado cooker. Made of ceramic, these charcoal-fired grills caught on in the United States and in the 1970s the Big Green Egg company was formed. 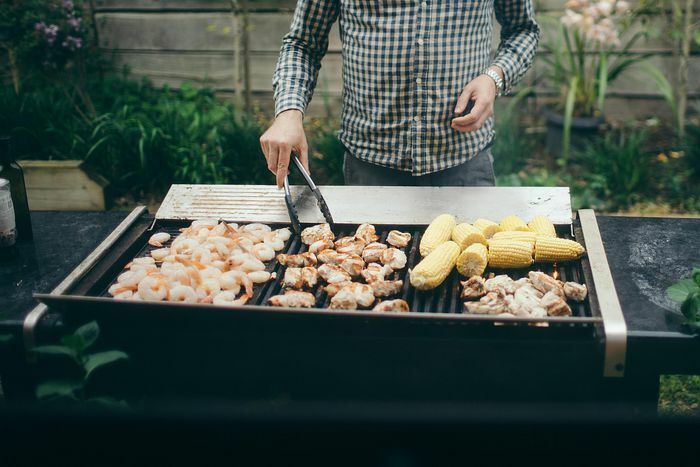 Slowly but surely this style of grill became one of the most popular charcoal grills, and more than a dozen companies have jumped into the market space. What people quickly realized about this style of grill was that it was perfect for low and slow cooking. Because of the simple airflow design and efficient insulation of the ceramic shell, these grills make perfect smokers. Before you can effectively smoke in most of these grills, you need something to block the direct heat. Big Green Egg calls this a plate setter (other Kamado makers have similar products). This indirect baffle blocks the radiant heat of the burning charcoal and lets you cook indirectly. Adjust the vents to hold a low and slow temperature and you have a smoker worthy of use in any barbecue competition. Because Kamado grills are capable of hitting temperatures over 750 F (400 C), they are excellent grills. Add to this the low and slow capabilities and you have the most versatile outdoor cooker on the market. Kamado grills tend to be very durable (unless you drop them) and are rather attractive. When compared with other charcoal grills, Kamado grills are considerably more expensive. Of course, when balanced with the advantages they can be worth the investment if you are a heavy user. The other disadvantage can be the size. While perfect for backyard barbecue, the space limitations of most Kamado grills doesn't give you the area to do a lot of barbecue, so while you will see these at barbecue competitions, the competitors typically bring several to gain enough surface area. There is a metal version of the Kamado grill on the market called the Big Steel Keg (as opposed to Big Green Egg). This version, which is an 18.5-inch grill like many of the other Kamado grills, uses high-temperature insulation sandwiched between an inner and outer metal skin. The Big Steel Keg actually has better insulation than the ceramics and a considerably better seal between the lid and the body than most of its competitors. It is, however, metal and needs care to prevent rusting. If you want a single unit that gives both high-temperature grilling and low and slow barbecue capabilities, then the Kamado grill is the best bet. There are a number of manufacturers on the market, but it is best to purchase one of these from a reputable and specialized dealer who can provide assembly and delivery, as well as support and accessories. Pellet grills use wood pellets as fuel, which are all natural hardwood sawdust compacted and extruded into small 1/4-inch round pieces. Generally, wood pellets have a predictable BTU output and produce a clean burn with a light smoke flavor. Most wood pellets are used for heating and indoor stoves, but since the 1980s when Joe Traeger started up Traeger Grills, they have found themselves used for outdoor cooking. Burning wood pellets in a grill or smoker produces the smoke and flavor as authentic as cooking over split logs of high-quality hardwood. The general design of a pellet grill consists of an external storage bin, called a hopper, that you fill with the wood pellets. An auger, basically a corkscrew turned by a variable low-speed motor, draws the pellets from the hopper into an internal firepot where the pellets burn, creating heat and smoke. The auger speed is adjusted, either by the user in the less sophisticated models or by a computer in the higher end units. The more technological pellet grills allow you to set specific cooking temperatures; some have meat probes and will reduce the grill's heat to a holding temperature when the meat is done. Structurally, pellet grills look like most gas grills and work similarly. Like the Kamado style grills, pellet grills work both as a smoker and a grill. Because they burn hardwood pellets, pellet grills produce good smoke quantity for both styles of cooking but are particularly good at smoking. With the computer control system, pellet grills are about as easy to operate as a smoker oven—all you need to do is fire it up (on some units preheat time is less than 10 minutes), put on the meat, attach the meat probe, set the computer, and walk away while the pellet grill does its thing. Pellet grills are not cheap, and a major downside to pellet grills over the years is the machinery. Pellet grills have a number of moving parts and auger jams and motor failure can happen. At worst, this means some expensive repair bills if the warranty doesn't cover the problem, and at the least, the unit will simply shut down and stop cooking. Another problem with pellet grills is that many of them look like they were made in someone's garage. While there are several manufacturers, most are small-time companies that don't have the advantages of mass production to put a serious finish on their product. While most pellet grills are excellent smokers, many are only mediocre grills, producing little more than 500 F (260 C). This will let you grill, but if you are looking for that intense sear on a steak then a pellet grill may not be the way to go. Pellet grills are generally good grills and very good smokers, but be selective in your purchasing. This is a very small segment of the grill market and yet there are a dozen companies making them, so do your research. Can You Smoke on a Grill? So after seeing all of the smoker options, do you need to buy a smoker if you own a gas or charcoal grill? Gas grills do not make good smokers, but charcoal grills, on the other hand, do. Charcoal grills burn, produce smoke, and if they have a lid and a good design, can hold low temperatures for long periods of time. What limits a charcoal grill acting as a smoker is the size. Most charcoal grills are too small to produce a lot of barbecue, so if you want to smoke more than two racks of ribs or a pork roast, then you will need something larger, or in other words, a smoker. The trick to smoking on a charcoal grill is to have a grill large enough to place the meat away from the direct heat of the charcoal fire. This is done either by cooking indirectly or by using some kind of baffle.